HSU students, faculty and staff are welcome to use the HSU Library Meditation Room, a small room available for quiet contemplation, meditation, reflection, or prayer. 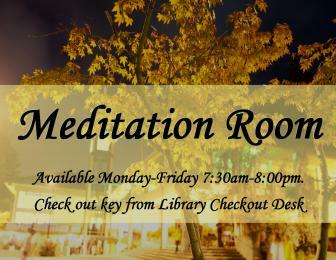 The Meditation Room is located in Library 21 and is available to all HSU students, faculty, and staff Monday-Friday 7:30am-8:00pm. Check out the key from the Library Checkout desk. Use is limited to 30 minutes, and multiple individuals may use the space at the same time, maximum 6 people. The first person to check out the room has full use of the room during the entire time the room is checked out, but we ask users to be mindful of the needs of others. We are happy to provide this meditation space to meet a variety of campus community needs. If you have comments or suggestions about the library, please contact the Library Dean, Cyril Oberlander.